Dutch yacht builder Heesen Yachts has launched the 11th superyacht in its 47 metre displacement series, hull YN 16947, previously known as Project Hé and now christened Asya. The steel-hulled displacement yacht was launched at Heesen’s facility in Oss in a private ceremony attended by the owners. 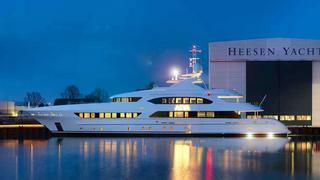 It follow's the recently launched and sold Heesen Project Margarita, another from the displacement series. The boat’s external lines are the work of Frank Laupman of Omega Architects, who has incorporated a series of modern touches, including continuous glued glass windows and matching black paintwork on the main deck and upper decks. Asya’s interior is designed by London-based studio Bannenberg & Rowell and Heesen says it has a distinctly Far Eastern, restful feel, inspired by the designs of Dieter Rams, Frank Lloyd-Wright and Tadao Ando. Combining silver-grey oiled oak, mid-gloss lacquer, silk and bronze with contrasting dark Makassar ebony and polished stainless steel detailing and accents, the yard says simplicity was the guiding principle throughout Asya’s interior design. Indeed, Hé in Chinese means 'the simplest form of peace and harmony'. Lighting is key throughout the boat and the designers have used concealed LED light strips and filtered daylight with venetian blinds to create a modern atmosphere yet with a strong connection to the marine environment. Asya will accommodate 12 guests. Two MTU diesel engines 8V 4000 M63 will power Asya, giving her a top speed of 15 knots and 12-knot cruising speed with a range of 4,000 miles. Since her launch, *Asya *has been at the Oss site for final construction and for the commissioning of all her systems. She was expected to be sea-trialled extensively in the North Sea early this year, for a scheduled delivery to her owners in February. The collaboration over Asya *is one of many Heesen has made with Bannenberg & Rowell. The two companies havealso worked together on the 37 metre race car-inspired superyacht Aurelia, the 47 metre superyacht *Raasta (ex-Elandess), superyacht Lady Petra and superyacht My Secret, and the 65 metre award-winning superyacht Galactica Star. Heesen, founded in 1978, have 11 yachts under construction with deliveries scheduled through to 2017.